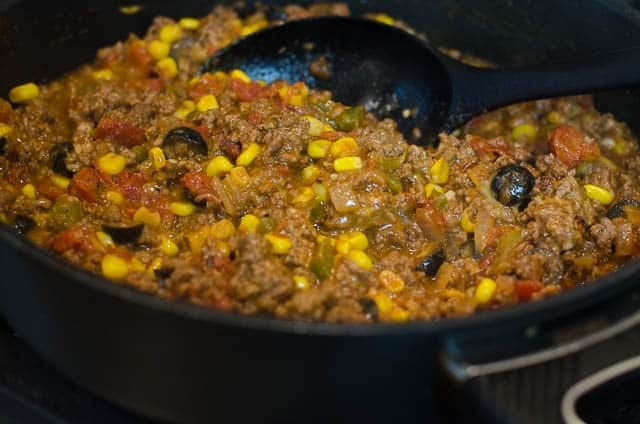 Saucy, seasoned ground beef is cooked with onions, green bell pepper, and corn and topped with a cheese-spiked cornmeal topping. 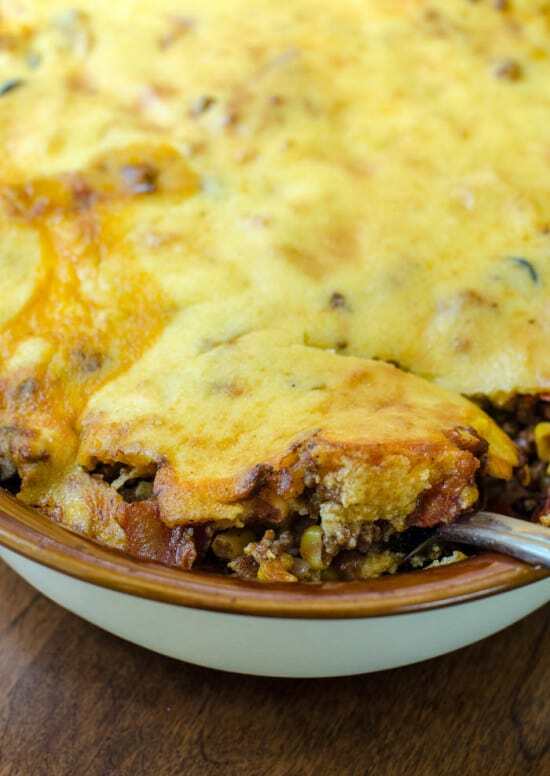 Tamale Pie is pure, old-school comfort food. 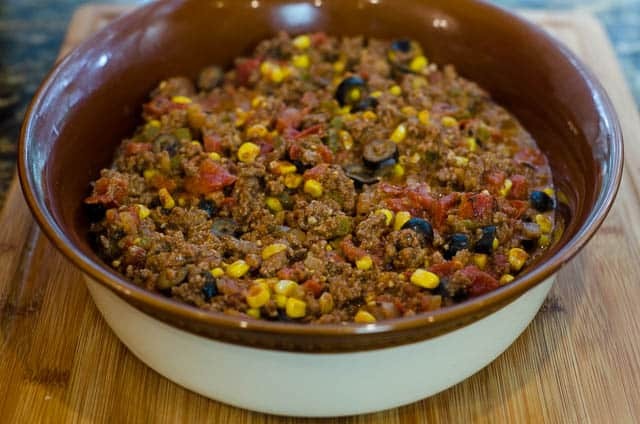 I was always thrilled when my mom put Tamale Pie on the dinner table when I was a kid. I honestly didn’t know anyone, young or old, who didn’t love it. 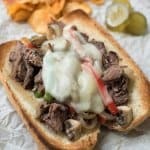 The combination of ingredients make it hearty, wholesome, and crave-worthy, and it just screams 1970’s. If you listen close, you’ll hear it. 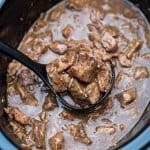 I believe the recipe actually dates back far earlier but it took on some new twists as it moved through time and this is the version I grew to love. It really has very little to do with it’s namesake, tamales, but this was true of many vintage recipes. I have a recipe from my mom’s collection titled “Chinese Chicken” which is so NOT Chinese, but I’d never dream of calling it anything else. It’s these throwback recipes that I find myself craving the most. When I’m tired, stressed, or under the weather even just a little bit, I yearn for a meal like this. 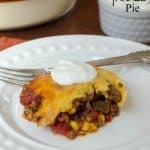 Traditional 70’s-style Tamale Pie does not have a thick layer of cornbread on top like many recipes I’ve seen. 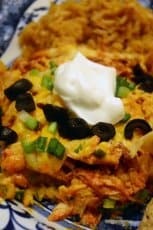 This recipe, like the one I grew up with, has a thinner cornmeal based topping that includes cheese. 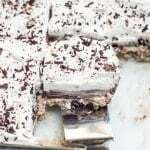 It has a light, velvety texture that forms a cozy blanket of goodness over the filling. This casserole dish is a great choice for a potluck or school banquet and it reheats beautifully. As a matter of fact, I’ll be reheating this very casserole for my family in just a couple of hours for our dinner tonight. I somehow managed to cook and photograph it without diving in. Self-control can be hard when there’s Tamale Pie close by. 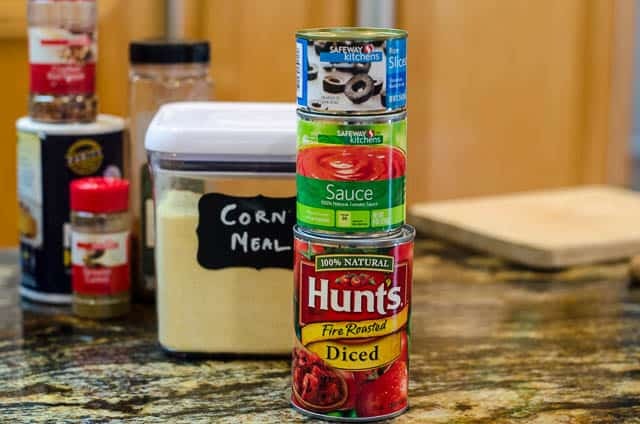 Since it calls for canned goods and other pantry basics, I almost always have everything I need to pull this recipe together. 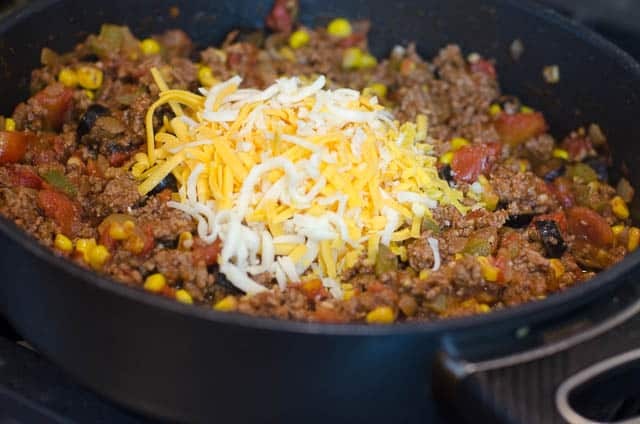 Place 1-1/2 pounds of ground beef, 1 cup of chopped onion, and 1/2 cup of chopped green bell pepper in a 12″ skillet over medium-high heat. Cook and stir until beef is crumbled and no longer pink. Pour off as much of the grease from the pan as possible and return the skillet to the heat. Add the garlic, diced tomatoes, tomato sauce, chopped olives, frozen corn (no need to thaw it…just throw it in! ), chili powder, salt, cumin, crushed red pepper, and black pepper. Stir the mixture together and bring it to a low boil and then reduce the heat to low and simmer for about 5 minutes. Add 1 cup of shredded cheddar cheese. I’m using a combination of cheddar and jack to use up what I had on hand in the fridge. Use what you have…or what you like! 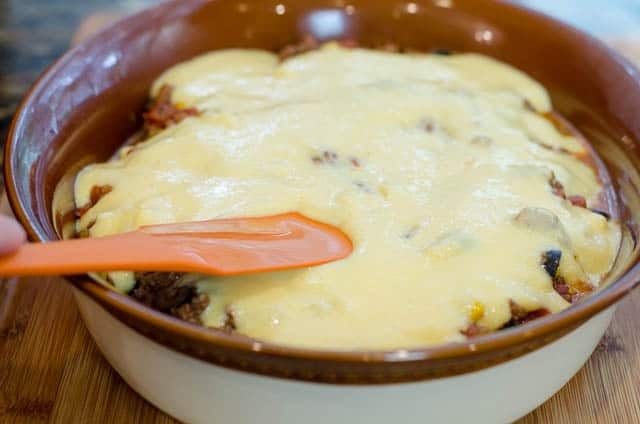 Stir the cheese into the beef mixture until it melts and then remove the pan from the heat. We’re done with the filling for now. Onward! Let’s start the topping. In a large, heavy saucepan over medium heat, warm 1-1/2 cups milk, 1 tablespoon of sugar, 1/2 teaspoon salt, and couple of tablespoons of butter. When the butter has melted, slowly add 1/2 cup of cornmeal, stirring vigorously as you add it. Cook and stir until the mixture is creamy and thickened. This will happen quickly. 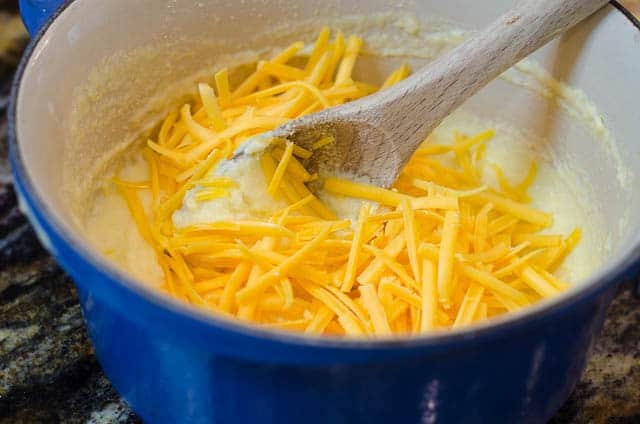 Remove the pan from the heat and stir in 1 cup of shredded cheddar and stir until the cheese melts. 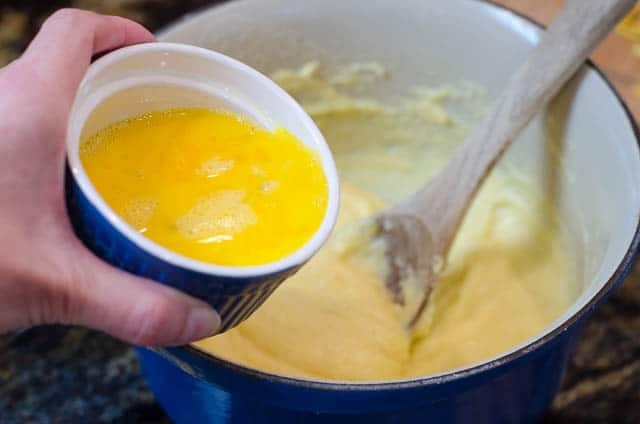 Now, sloooowly drizzle in two lightly beaten eggs and really go at it again with that wooden spoon to get the eggs incorporated into the warm cornmeal mixture before they begin to set up. Transfer the beef filling to a casserole dish that is coated with non-stick cooking spray. Pour the cornmeal topping over the beef mixture. Use a rubber spatula to spread the topping out to the edges of the pan. It’s okay if it’s not perfect. That just means the delicious filling will bubble up and around the edges of the topping as it bakes. Yum. 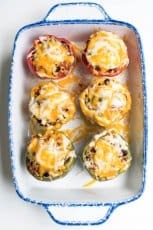 Pop the casserole dish in a 375 degree oven for about 30 to 40 minutes, or until the topping is nice and golden brown and the filling is bubbly. Now the hard part – after you remove it from the oven, let it sit for about 5 or 10 minutes to cool and set up a bit before serving. I know you can do it! And, definitely serve it with sour cream. It’s a must…in my book anyway. Preheat oven to 375 F degrees. Lightly coat a 13" x 9" (or slightly smaller) casserole dish with non-stick cooking spray. 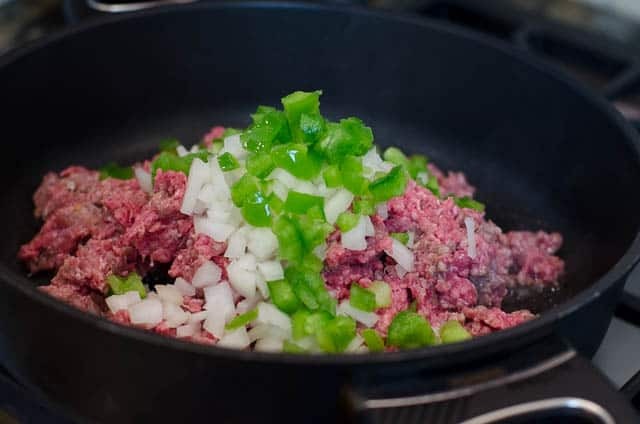 In a large skillet over medium-high heat, brown ground beef with onion and green bell pepper. Cook until beef is no longer pink and then drain off as much grease from the pan as possible. 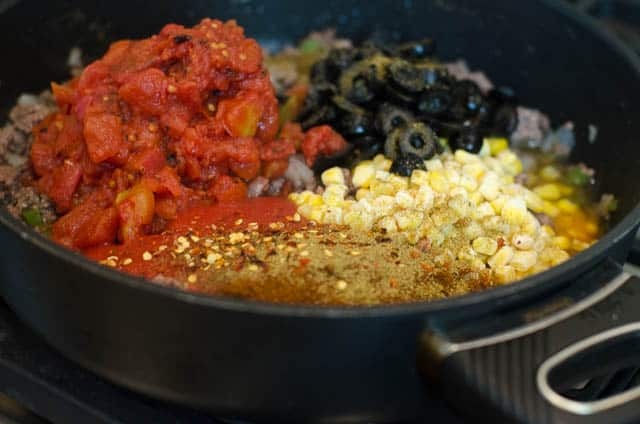 Stir in garlic, tomatoes, tomato sauce, corn, olives, salt, chili powder, cumin, crushed red pepper and black pepper and bring to a low boil. Reduce heat to medium-low and simmer for 5 minutes. Stir in 1 cup shredded cheddar cheese and simmer till melted. Transfer to prepared dish. In a large saucepan over medium heat, warm milk, 1 tablespoon sugar, 1/2 teaspoon salt and 2 tablespoons butter, until butter has melted. 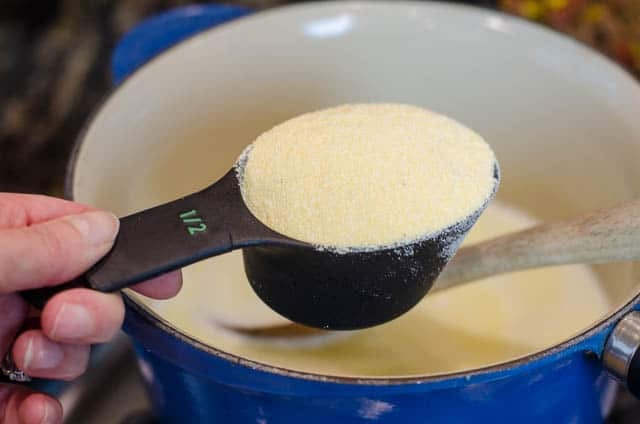 Reduce heat to low and stir in cornmeal, a little at a time, stirring vigorously with each addition until smooth and thickened. Remove from heat and stir in cheese. Slowly drizzle in the beaten eggs, stirring vigorously until combined. Pour cornmeal mixture over meat mixture, smoothing out evenly over the surface. Bake at 375 degrees for 30 to 40 minutes until golden brown and bubbly around the edges. Remove from oven and allow to cool for 5 to 10 minutes. Serve with sour cream. 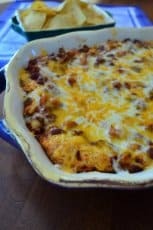 You might also want to check out my Chili Cornbread Bake. In this recipe, a chili-like filling bakes on top of a sweet layer of cornbread. 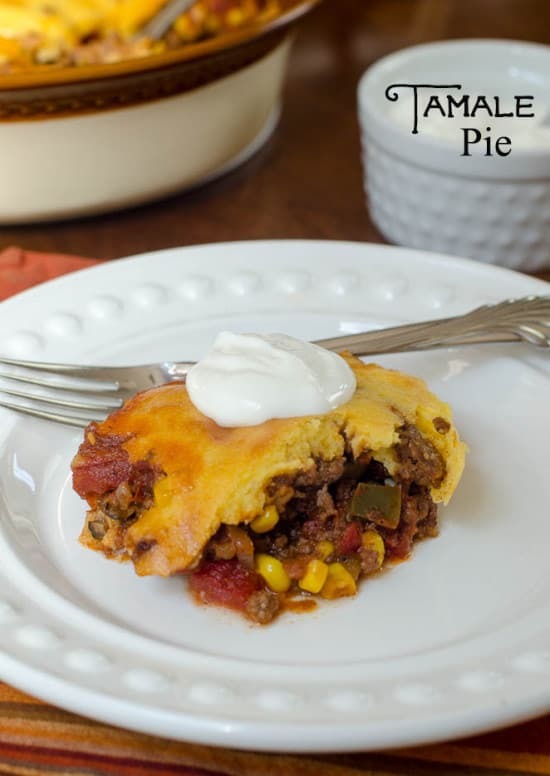 Not a traditional Tamale Pie in any sense but super tasty! Valerie, you are right – this is absolutely comfort food at its best! Can’t wait to try this one. You’d need an awfully large baking dish in order to double it so I’d recommend baking two casseroles. I hope you all enjoy it! 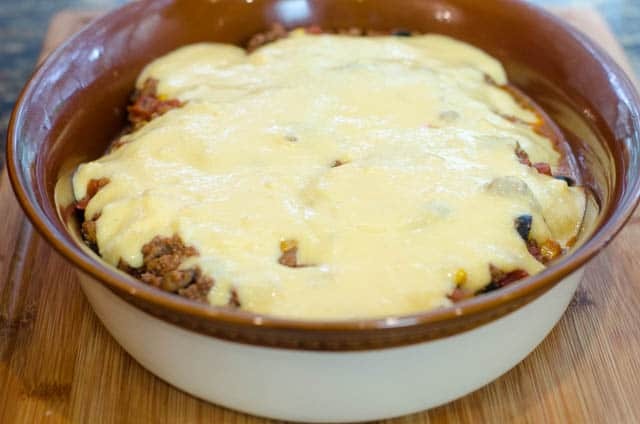 Have you ever assembled this tamale pie and then frozen it? I have not tried freezing it, Louise, but I think it would probably work out well. If you give it a try, be sure to come back and let me know how it worked out for you. I made it today using two smaller pans so I could give half to my daughter. 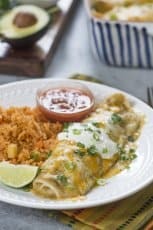 I used a 10 1/2 can of red enchilada sauce because I didn’t have tomato sauce & only used about a tsp of chili powder because I figured there was already some in the enchilada sauce. I also added a can of drained rinsed black beans just because I like them. It came out wonderful. I served it with a fried egg over the top of each serving and a little sour cream. I will let you know if I ever try to freeze one or if my daughter freezes hers. I will be making it again and think it would be an awesome dish for a potluck. Made a double batch last night and gave one to my sister to eat with kids/grandkids. It was DELICIOUS! 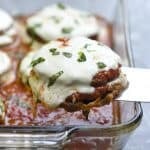 I don’t know (and don’t really care) how many calories and fat grams are in this recipe, the shredded cheese added to the ground beef mixture gives it such a delicious creaminess! Almost made my eyeballs roll back! My sister and her family loved it too and appreciated the yummy treat! Thanks so much for the recipe! My family and I loved it and I’ll make it again. 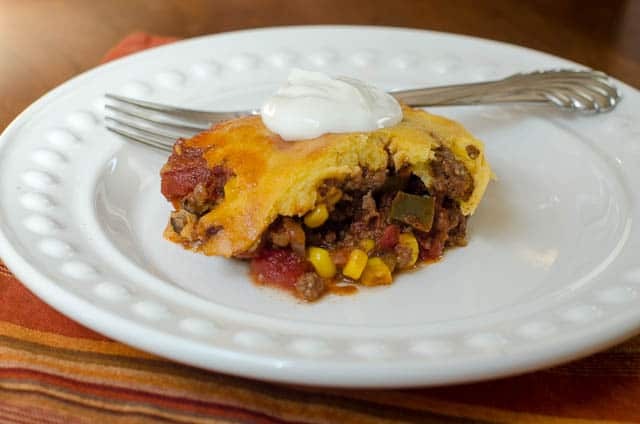 I’d heard of tamale pie but never had it before…yum! In case this helps anyone, I made it with one pound of ground pork and it tasted fine. I didn’t have any tomato sauce so I used a bit of tomato paste and water. I also used a bit less cheese (for health reasons, I’m sure the amount in the recipe would taste wonderful!). Going to give it a try, since my amazing wife passed away from brain cancer t 23 months I’ve taken cooking as a hobby. Favorite comment of the week! Thank you, Jill 🙂 I’m so glad you liked the post AND the recipe. I made this last night and it was really good!! I can’t wait to have leftovers tonight! The only changes I made were I added the whole bell pepper and some extra cumin. I give this recipe 5 stars! O loved this. More important my grandkids did. It was a big hit. The only thing I changed was to add a half cup of cream corn to the topping mix. It was great extra moist. That’s fantastic, Tonia. Love your little modification. Sounds wonderful! My family loved this… Thank you. I have assembled the filling for the tamale pie. Make the cornmeal crust and followed your recipe. I am wondering if I can bake it tomorrow? I’m sorry I didn’t see your comment until today, Freddie. I’ve never assembled it ahead and refrigerated it but if I did, I would probably not add the top layer until I was ready to bake it. I hope it turned out well for you! 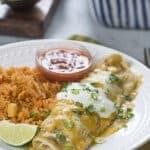 I usually follow the recipe on the box of cornmeal and I thought it always calls for red enchilada sauce instead of tomato sauce to geve it that tamale flavor. Has anyone else ever tried it that way? 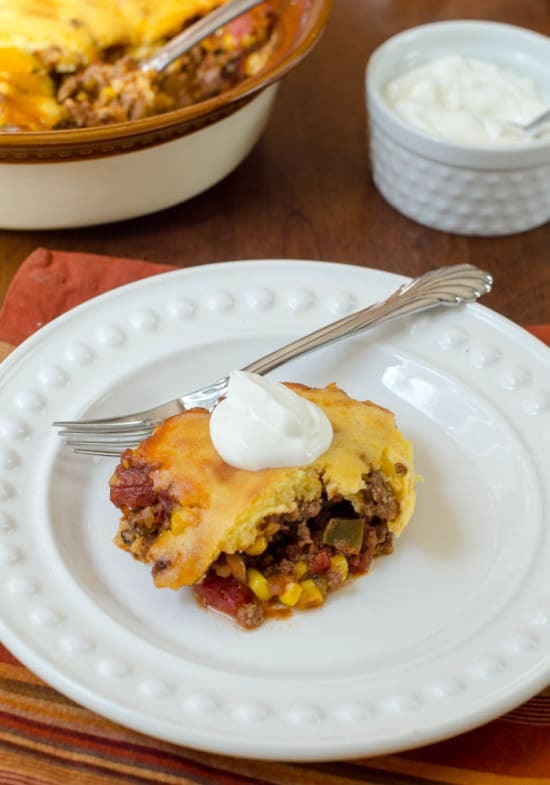 This recipe will make anyone loving a Tamale Pie, do the happy dance ! I couldn’t find my recipe and was getting inpatient with myself….. so decided to give yours a try . All I can say is amazing delicious ! I’ve made twice in 2 weeks . This was a favorite growing up! 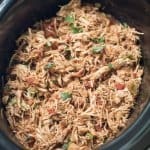 I found your recipe and decided it was pretty close to my mother’s and started cooking! She and granny always added black olives to theirs so I had to add them to mine, I forgot the cheese in the meat but it was delicious without it lol so I look forward to trying it With it ☺ Thank you for sharing, Esther. Wanted a recipe that I could use ingredients I already had. Only had to buy a few things for this. Some tamale recipes use jiffy mix (too sweet for me) I made this. Omitted sugar for diabetic reasons..
Subbed a little honey. Unused some Italian Turkey meat along with hamburger meat I had. I also added can of green chilies. This recipe very easy and very good. 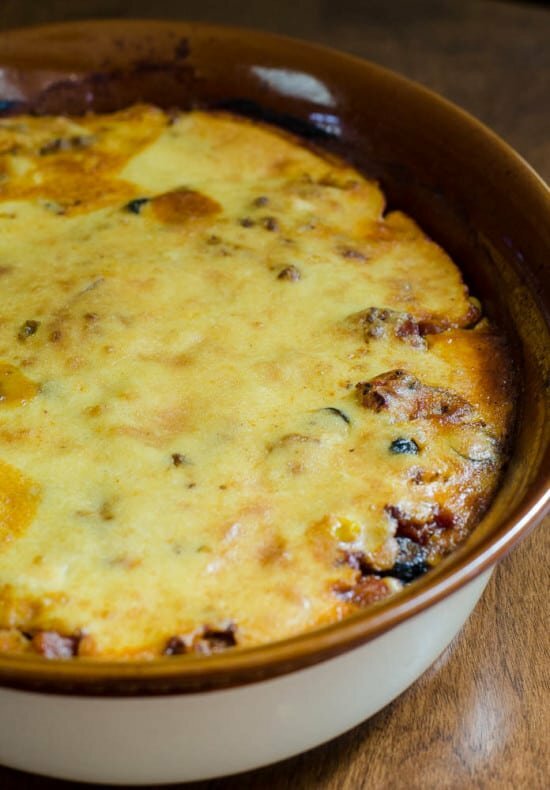 Great winter casserole. Only problem I had is keeping to one serving. I used to make this with a box mix! 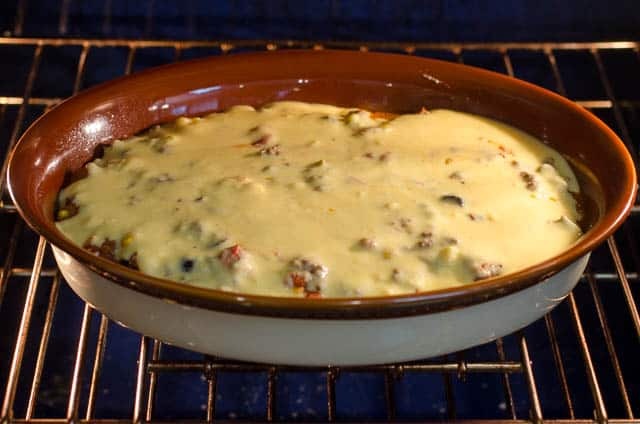 It’s in the oven now and can’t wait to try it…oh, I used a can of green chilies because no black olives in pantry..I tasted both the sauce and cheese cornmeal topping..so delicious with the cheese mixed into it! Happy I found your recipe Valerie today! It’s a favorite already…thank you for sharing it! Amazing just as how you present the recipe. Don’t change a thing!!!! I’m vegetarian, so I used half black beans and half crumbled tofu baked in coconut soy sauce and Thai chili paste. I also didn’t have milk, so used sour cream thinned by equal amount of water instead. And I used Anaheim peppers instead of green peppers (a little bit spicier.). This was so delicious. My mouth is watering in anticipation of leftovers. Thank you.